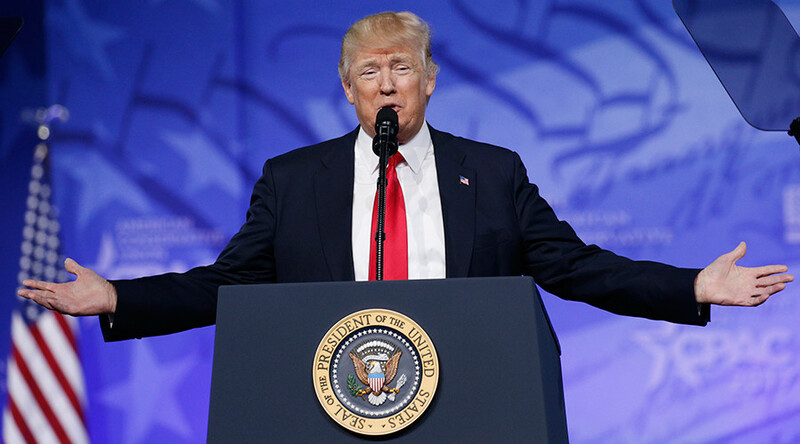 Donald Trump’s announcement that he will not attend the White House Correspondent Association’s dinner has been met with a combination of criticism, mockery, and trepidation, as people react to an unprecedented break from tradition. Trump’s tweet on Saturday came amidst increasing tension between the president and the press. The White House excluded a number of media organizations from a White House briefing on Friday, prompting anger among the media. Trump described the mainstream media as “the enemy of the people” and the “opposition party” on Friday. A number of media organizations said they would not attend the April event in response to the White House’s treatment of the media. The New Yorker canceled its pre-party and Vanity Fair pulled out of its after party with Bloomberg earlier this month. It is tradition for the president to attend the annual dinner, which takes place every year to raise money for journalism scholarships. The last president to miss the event was Ronald Reagan – who was recovering from being shot. At the dinner, the president is usually subjected to a “roasting” by a comedian, and also delivers a speech that often pokes fun at the press – a difficult task for Trump, who has derided the media since his presidential campaign. The announcement has stirred wide debate among social media users, many of whom accuse the president of being afraid to face the media, with some using the hashtag #chickenTrump. @realDonaldTrump You haven't dodged something in such a cowardly manner since the Vietnam draft. “The WHCA takes note of President Donald Trump’s announcement on Twitter that he does not plan to attend the dinner, which has been and will continue to be a celebration of the first amendment and the important role played by an independent news media in a healthy republic,” White House Correspondents Association president Jeff Mason said in a statement. Staff: Will you be attending the #WHCA Correspondent's Dinner? Many people took the opportunity to remind Trump of when Obama used his 2011 WHCA speech to poke fun at the then-reality star for his belief in the ‘birther’ rumor, which suggests that Obama is not an American. Obama also made fun of the idea of Trump, who was a guest at the event, running for president – likely never believing it would come to pass. Others drew on Trump’s previous statements and tweets in reacting to the announcement. @realDonaldTrump I'm amazed you haven't called it a "FAKE DINNER," yet. @ShaunKing He will put on his bathrobe and watch the replay though.Because it's about him. Can't wait to read his petulant tweets! Maybe Frederick Douglass can take Trump's place. There were calls for Trump impersonator Alec Baldwin to come in place of the president. Some people suggested that Barack Obama, or even Hillary Clinton, should attend instead. @PuppyOnTheRadio@realDonaldTrump Why would you go and break bread with liars, cheaters and creative manipulators of the truth? @realDonaldTrump you need to win over your enemies man, not defeat them! You came this far despite all opposition, don't chicken out now! Some joked that the “real” president, Trump’s chief strategist Steve Bannon, should attend instead, hinting that the former Breitbart head enjoys substantial influence in the White House.